Walking into Convocation Hall, the former Pitts Theology Library, a restoration of terracotta decorations carved in the entrance archway greets visitors but quickly gives way to a modern, chic atrium. The $20 million renovations and 14 months of construction have revitalized three floors, which include original white marble tile and vaulted wooden ceilings. The building, located on the Quadrangle and built in 1916, was one of the first buildings constructed on Emory’s Atlanta campus. During renovations, the building’s and campus’ historical roots were kept in mind while adding modern tastes and necessities, according to Vice President for Campus Services Matthew Early. University President Claire E. Sterk’s office, among several other administrative offices, has been relocated to the third floor of the hall, and the Board of Trustees plans to meet in the hall. Sterk’s office was previously in the Administration Building on the Quad. According to Early, University administration is still deciding how to best use the president’s previous office space. Office space in Convocation Hall includes central meeting rooms that administrators can reserve in advance. “Touchdown” spaces, as Early calls them, were designed to foster employee coordination and are commonly included in new Emory buildings. Early said that students may be able to reserve the spaces for programming in the future. A large circular window adorned with white stucco on the third floor provides an aerial view of the Quad. The windows on the third floor are mounted in their original frames, which, according to Early, are more than a century old. These plentiful, ornate windows flood Convocation Hall with natural light. Additionally, various windows throughout the building are equipped with privacy glass, which can become opaque with the flip of a switch. 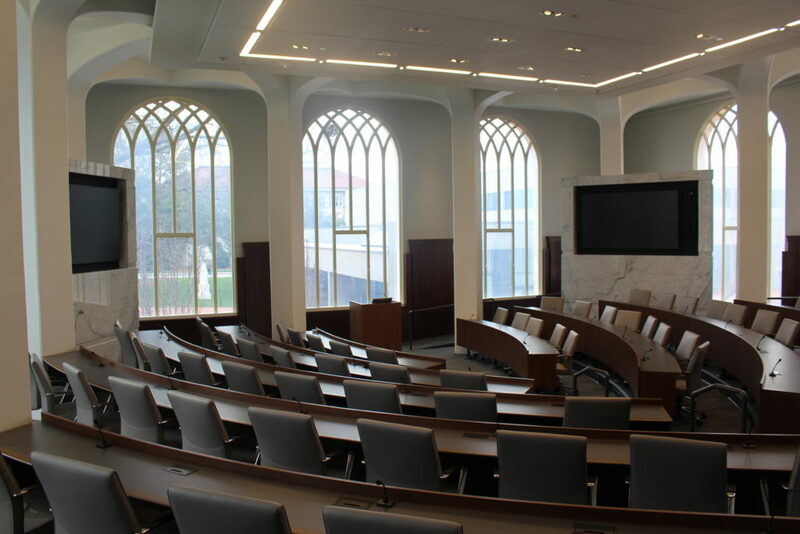 Some of these windows are found in what Early called the reading room, a room with multiple tiers of tables and chairs outfitted with microphones and centered around a podium. Other updates modernized the building to comply with the Americans with Disabilities Act and fire safety code compliance. These included adding an elevator, a secondary staircase and additional bathrooms, including a gender-neutral bathroom with a shower. The largest room in Convocation Hall has been converted into an event space. Chief of Operations in the Office of the President Anjulet Tucker said Conversations on the Quad will later be held in the event space. Tucker added that Sterk will begin holding her student coffee hours in one of the lounges in Convocation Hall. Sterk expressed approval of the renovations in a Jan. 29 statement that Associate Director of Media Relations Elaine Justice sent to the Wheel. “The restoration of Convocation Hall reflects our past and will provide our community with exciting new opportunities to collaborate, converse and engage with each other, the Atlanta community and visitors from around the world,” Sterk wrote. Convocation Hall is part of the Emory University District under the National Register of Historic Places, a list of historically significant locations worthy of preservation. The Emory University District includes the buildings surrounding the Quad as well as Glenn Memorial United Methodist Church. Convocation Hall previously housed the office of the University chancellor, the position which would later be called president, after the University’s relocation from Oxford to main campus.